The next on the calender is The Super Bowl. Yeah! You heard it right. It’s the Super Bowl on February 6th of 2011. US is all a flutter with it. Highest viewership, most expensive advertisements of the year, great food to munch and lovely friends to cheer is my definition for it. I am a big time football fanatic (Americans call it soccer) and a faithful Man-U fan. So, the American football is new to me. I watched this game for the first time during last year ‘s Super Bowl and all I could see in the field were huge muscular men in skin-tight clothing running around hitting and hurting each other. Such a barbaric game, I thought to myself. I know “free kick”, “penalty shoot-out”, “penalty corner” but “touch down”, “special teams”, “quarter back”, “wide receiver”, “turn over” were Greek and Latin to me. There is a huge difference between these two games. Anyways, I watch Super bowl for the super funny advertisements and scrumptious food. More than the game, even my dearie husband and his friends (the so called NFL fans) are on my side.We make sure that our tummies are full and the coffee table gets loaded with good food. This year the menu on the list are crispy naan pizza, bowls of channa masala topped with crunchy red onions and garden fresh cilantro, spicy oven-roasted almonds, colorful tri-berry lemonade (recipe here) and chilled beer. Today, I will start the Super Bowl snacks series with the recipe for Naan pizza. The store bought naan is topped with favorite veggies and sun dried tomato pesto. The Naan pizza was perfect; very crispy at every bite and little soft in the centre, leaving behind a perfect taste. The pesto was garlicky, smooth and very delicious with an intense tangy-sweet flavor from the sun-dried tomatoes. Paneer, the Indian cottage cheese, was crumbled and layered on top together with the crispy onions, spicy jalapenos, sweet tomatoes and spinach. 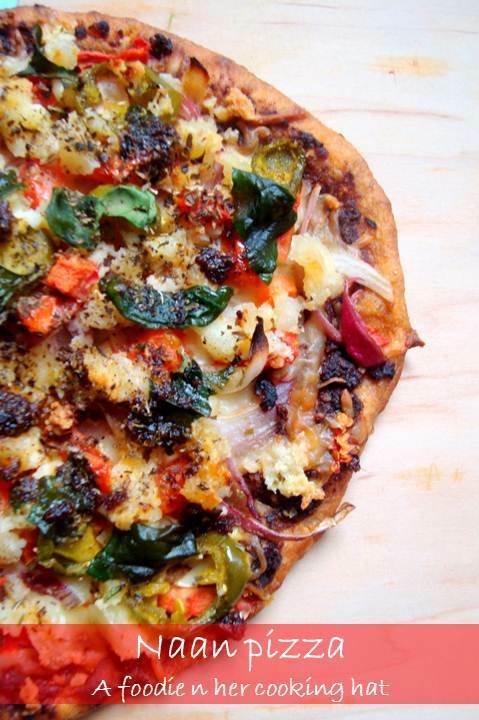 The colorful toppings made my pizza look so pretty. We loved its taste in every mouth. Grind the listed ingredients with 2 tbs olive oil to a fine paste. Set them aside. Pre-heat the oven to 350’F. Place the pizza stone inside the oven and let it get heated. Place the paneer in hot water to soften, approximately for 15 minutes. Once done, drain the water and crumble it with your hand to small pieces. 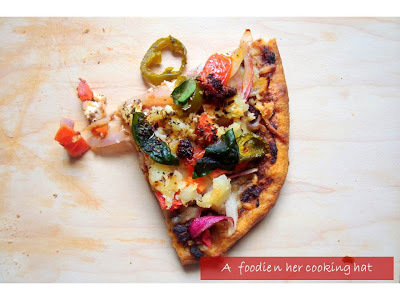 In a clean chopping board, place the store bought naan, layer them with generous amount of pesto, followed by cheese, onions, tomatoes, spinach, jalapenos, crumbled paneer and little more cheese on top. Finally sprinkle oregano, thyme, basil and pepper over them. Place parchment paper or aluminium foil on top of the pizza stone and then place the naan over it. Cook for 13-15 minutes, until they get crispy. 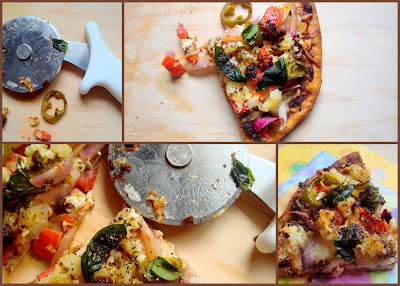 slurp !have posted whole wheat pizzas in my blog today – loved ur quick version too ! Thats a cool idea! Have to try this out for my kiddo! 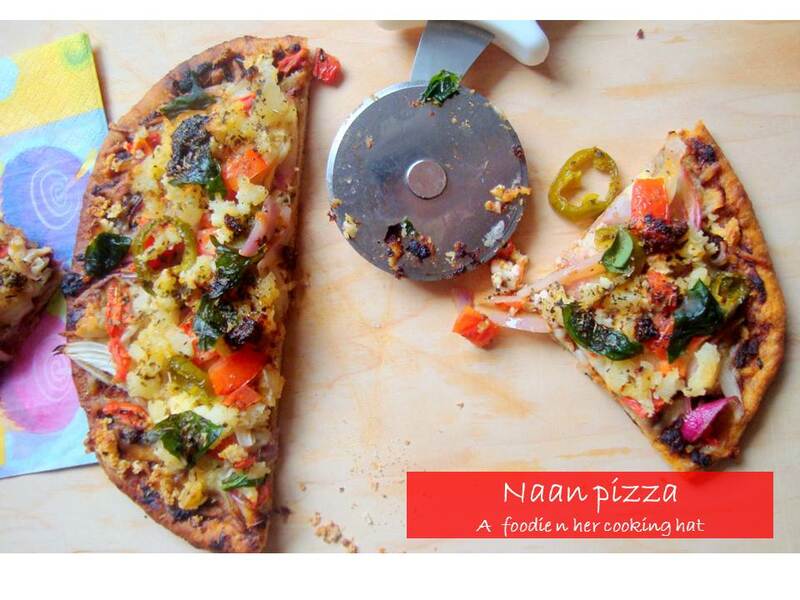 Yumm, nice twist to the usual pizza, Naan pizza looks soo marvellous.. Thanks for stopping by "Tasty Appetite". Wonderful space you have with picture perfect recipes..